I've read only about half of all the Wolfe and Goodwin stories, but always thought this one was the absolute best one of the lot. 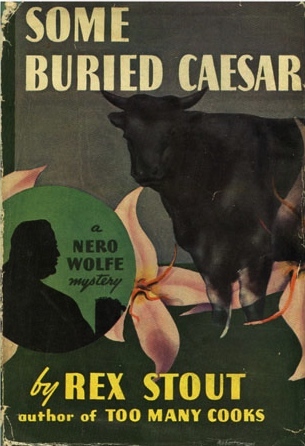 Stout really seemed to have elevated above himself when wrote Some Buried Caesar. Plot, characters, setting and writing interlaced perfectly and some of the best scenes from the series came from this book (e.g. Archie in the country jail). I wish he had written more like this one. Archie in the jail is definitely a highlight! I have many, many favorites among the Nero Wolfe novels, and I have read every novel and collection of novellas in the series. More than once each. But Some Buried Caesar is in my top five (and it is the one I was planning on rereading next). I love so many things about it. The Exposition, Archie's time in jail, the scenes with Lily Rowan. You have done a great job with this review. The Exposition, Archie's time in jail, the scenes with Lily Rowan. I loved so many of the scenes at the Exposition - it was a great setting and Stout used it to perfection. And he got the tone just right - there's plenty of humour but it's not overdone.